The Shore Road club’s all-time leading goalscorer, Jordan Owens was introduced at the start of the second half and almost instantly put Crusaders back into the driving seat as the champions bounced back to record a first win in three games. 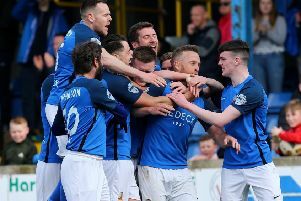 And while the result certainly flattered Crusaders, who have yet to hit the heights of last season, Baxter believes the emphatic second half performance will lift the confidence levels at Seaview. “I thought the change was needed at half-time once we got through the first half and the wind was very strong down the pitch, the game was ready for Jordan Owens to come on and wreck havoc which he did and we got the goal early to settle us down,” said the Crusaders boss. “He hasn’t been at his best this year and had been carrying a calf injury from last season and you ask him to go out and give it his best every week. He’s picked up a few injuries and just isn’t firing on all cylinders which is normal. We’ll bring him back gradually into the team but it was good to see Rory (Patterson) get a goal today too. Much has been made about Crusaders poor run of form but Baxter insists he was never overly concerned and believes Saturday’s win can provide a platform going into next weekend’s north Belfast derby against Cliftonville at Seaview. On Forsythe’s wonderful second half strike, Baxter admits he asked the midfielder if he meant it as he brought him off with seven minutes to go. It was a frustrating afternoon for ‘Stute boss, Paddy McLaughlin who is delighted to see the back of September having registered just a single point from five games during the month which involved games against Glentoran, Glenavon and Crusaders.